The town known as Mauch Chunk changed its name in 1954 to honor the famous Native American athlete, Jim Thorpe. Thorpe (1887-1953) is buried here, in a 20-ton mausoleum, although he had no ties to the town during his lifetime. Located in Carbon County, along the Mauch Chunk Creek not far from the Lehigh River, much of the town remains as it did when the coal industry, railroad, and canal system came together to create a wealthy town beginning in the 1820s. Situated at the eastern end of the Southern Anthracite Coal Fields in the Blue Ridge Mountain, Mauch Chunk boomed in the mid-19th century, becoming a central transportation link in the anthracite industry and the site of important transportation innovations such as the bear trap lock designed by Josiah White and the Mauch Chunk & Summit Hill Gravity Switchback Railroad. The switchback railroad was the first railroad constructed for the movement of coal in this country. Mauch Chunk became a tourist town as the coal industry died out; and the switchback became a tourist attraction drawing people from urban areas along the east coast to the country for a ride along the line. Today a 16-mile trail exists along the former railroad bed. Other features of the Mauch Chunk Historic District include St. Mark's Episcopal Church, designated a National Historic Landmark in 1977, and the Carbon County Jail, where10 members of the Molly Maguires were jailed, tried, convicted and executed. The Molly Maguires were a secret organization formed by Irish immigrant coal miners who fought for better working conditions in the coal fields of western Pennsylvania, beginning in 1862. Twenty-four Molly Maguires were convicted of murder in the fall of 1875, as a result of evidence gathered by a Pinkerton detective, hired by the Philadelphia & Reading Railroad. After the10 were executed in Mauch Chunk, and the others sentenced to jail terms of two to seven years, the organization was crushed. 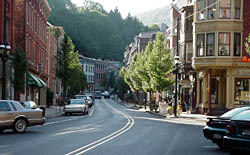 The Old Mauch Chunk Historic District is located on Broadway and Race Sts., in Jim Thorpe. Many of the buildings in the district remain privately owned and are not open to the public. However, public buildings are open during business hours and several mansions offer tours and museums. The Mauch Chunk Museum and Cultural Center, located within the Mauch Chunk Historic District, on 41 West Broadway St., is open all year, 10:00am to 4:00pm, every day, except Monday. There is a fee. Groups by appointment. Please call 570-325-9190 for further information or visit the website.